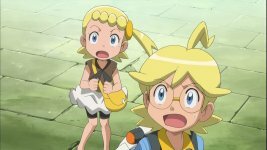 Bonnie is Clemont's sister and joins him in his travels in order to help him find a wife. 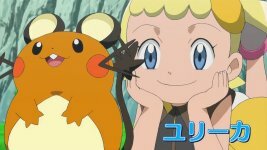 She also holds onto the various Pokémon that Clemont , specifically Dedenne., and is easily excited by new Pokémon. Serena is a Pokémon Trainer who is just starting her journey. However, she has a history with Ash, having been childhood friends in years gone by. After not knowing what to do, she eventually decided to enter Pokémon Showcases to become the Kalos Showcase Queen. The first in the Pokémon XY saga lasted around 100 episodes and featured the journey of Ash, Clemont, Serena and Bonnie as they went through the Kalos region, battling the first 7 gyms, up to Anistar City. Throughout their journey, they encountered Korrina and Dianthe, who had Mega Evolving Pokémon, as well as making various friends and rivals across the region. 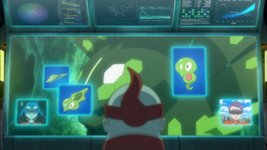 The Mega Evolution episodes are a small series of four special episodes spread across the Pokémon XY series. These episodes featured the trainer Alain, former assistant to Professor Sycamore, as he travelled the Kalos and Hoenn regions to battle all the Mega Evolved Pokémon with his partner Charizard, but in doing so found himself caught up in a Team Flare plot and making friends with rookie trainer, Mairin.